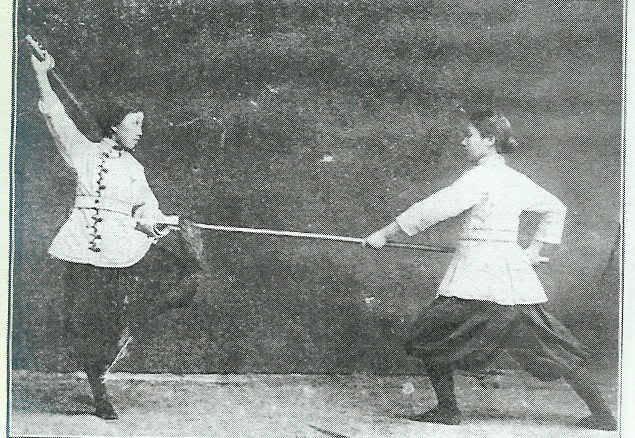 Lives of Chinese Martial Artists: Qiu Jin—the Last Sword-Maiden, Part I. Female martial artists (including Chen Laoshi) from the later Jingwu Association, another liberal group seeking to use the martial arts to reform and “save” chinese society. This is the first post in a new occasional series here at “Kung Fu Tea.” These entries will provide brief biographies, and pose some thoughtful questions, about the lives of China’s martial artists. Given my research interests a lot of these individuals will be from the South, but as the series goes on I hope to expand the scope of my expertise. One of the basic problems when it comes to writing about Chinese martial culture is the very phrase “martial arts.” These words are saddled with a lot of baggage in modern western society, much of which is uniquely unhelpful when it comes to understanding the vast range of past (or even current) practices. Casual readers assume as a matter of course that they know what the “martial arts” are. After all, they watch Kung Fu movies, they did some Judo in college or they drop their daughter off for her Tae Kwon Do “Little Tigers” class every Wednesday. This erroneous assumption of expertise then leads to misunderstanding once they begin to seriously delve into questions of martial history or culture. Much of what we do today has vanishingly little in common with what the east Asian martial arts actually were in most times and places. This is especially true when one starts to think about the traditional Chinese martial arts. Many of the outward trappings of modern commercial martial practice in America (crisp white uniforms, colored belts, discipline, militarism that “build character,” and franchised distribution) are actually artifacts of the Japanese post-Meiji Restoration renaissance in hand combat training. These practices were exported to America after WWII, especially with the growing popularity of Judo, Aikido and later Karate. American consumers have accepted this commercial ethos on such a deep level that it has almost become subconscious. All martial arts must have colored belts and complex advancement tests…because that is what martial arts do, right? Needless to say the traditional Chinese arts were usually taught quite differently. Yet increasingly we are seeing Kung Fu schools (even within the style of Wing Chun-which ostensibly rejects such conventions) handing out colored sashes and on-line Sifu’s bragging as to what rank they have achieved in a grading system that was invented in California in the late 1990s. In the world of commercial martial arts practice I find these trends to be merely irritating. But when discussing history they are genuinely dangerous. All of which brings us back to the essential purpose of this series of biographical posts. We often have an artificially narrow view of what the traditional Chinese martial arts were and how they were expressed. If it wouldn’t fit in a strip-mall storefront we don’t recognize it as part of the martial realm, even when wonderful examples of it are right in front of our eyes. For instance, when was the last time that you saw a discussion of horsemanship as a critical skill in the traditional Chinese martial arts? Or archery? How about an ability to master the subaltern dialects and coded speech patterns of bandits and secret society members so that either negotiations or interrogations could be carried out? Yet in the mind of most Ming and Qing era soldiers and martial artists these were the skills that basically defined the profession. Clearly there is a need to broaden our view of who the Chinese martial artists were and the sorts of varied life experience they possessed. My overriding goal in this series of posts is to demonstrate that the “Chinese martial arts” were never just one thing. We need to better appreciate the richness of the lived experience of the “martial artists” that we find in the historical record. Indeed, this may even necessitate abandoning the concept that there is any such thing as the “Chinese martial arts” as a singular, easily understood, category. Instead what we actually see are a wide variety of martial practices adapted by different sorts of people for their own reasons at various times and place. Rather than discussing “Chinese martial culture” in the singular it should be discussed in the plural. Portrait of Qiu Jin, dressed in male Chinese attire. Qiu Jin (November 8, 1875- July 15, 1907) is perhaps the most interesting martial hero to emerge from Southern China in the early 20th century that almost no-one in the west has ever heard of. Even in martial arts and political circles I get mostly blank stares when I mention her name. She is better known among the small circle of scholars that study gender or revolution in modern China. The situation is all the more puzzling as she is far from forgotten in either China or Japan. The Chinese consider her to have died a martyr to the 1911 revolution and a substantial body of folklore and legends have grown up around her life. The government has even built a memorial and small museum in her honor. Her life has also been the subject of a number of scholarly treatments in Japan. These focus both on her revolutionary exploits and her poetry, some of which was quite accomplished. Most of the best scholarship on Qiu Jin is actually published in Japanese. I spent a semester going through it with a Japanese graduate student and the exercise was interesting. However, its probably not necessary if one’s main interest in Qiu Jin is the martial arts aspect of her career. Yamazaki Atsuko’s 2007 volume Shu Kin Kaen No Hito contained a brief but helpful discussion of her childhood exposure to, and training in, martial arts. Perhaps the most reliable discussion of Qiu Jin’s life and revolutionary career in the English language literature can be found in the writing of Mary Backus Rankin. In 1975 she published a conference paper and book chapter titled “The Emergence of Women at the End of the Ch’ing: the Case of Ch’iu Chin.” The piece appeared in Women in Chinese Society (Stanford UP, 1975) edited by Margery Wolf and Roxane Witke. Also valuable is the discussion of Qiu Jin provided on pages 85-93 of Jonathan D. Spence’s The Gates of Heavenly Peace: The Chinese and their Revolutionaries 1895-1980. Penguin. 1982. Qiu Jin is an important figure to understanding both emerging Chinese nationalism and feminism in the late Qing period. Her literary output needs to be better researched. Also interesting is how her background in Chinese Wuxia novels and martial culture conditioned her behavior as a revolutionary. Clearly we need a comprehensive English language biography on this figure. While that is beyond the scope of any blog-post, it is possible to summarize what we know of her life and military career and to ask some thoughtful questions that might stimulate future research. The Life of Qiu Jin: Feminist, Revolutionary, Poet, Terrorist, Martial Artist. Qiu Jin was born in Xiamen, Fujian Province, in 1875. She was born to a mid-level gentry family that might have enjoyed a very comfortable existence, except of course for the decline of the Confucian trained bureaucracy that accompanied the end of the Qing regime. Her family was relatively rich with degree holders, though not all of them got the best postings. Her great-grandfather, grandfather, father and brother all held various positions within the government, but her father never rose much above the level of local secretary even though he was probably a Juren degree holder. As a girl she grew up at the family estate in Shaoxing in Zhejiang. While she lived in number of places including Beijing and Japan, Qiu Jin repeatedly returned to northern Zhejiang and seemed to have considered the area home throughout her far ranging career. Rankin points out that the family’s educational background was probably critical to Qiu Jin’s later development and unorthodox outlook on life. Far from being stifling or overly conservative, the family seems to have been part of a minority Confucian school of thought that saw women as being capable of moral development, ethical behavior and excellence in education. While by no means universally held, gentry families from this school tended to educate their daughters and even encourage their artistic pursuits in the areas of writing, literature, poetry and painting. This certainly appears to have been the case with Qiu Jin who proved throughout her revolutionary career that, while she was perfectly happy to even engage in violent struggle, her pen was the sharpest weapon of all. Qiu Jin seems to have been indulged by both her parents and other male family members. Her feet were bound as a child, but not very tightly. She is remembered as having an uncommonly active and athletic childhood. She learned to ride a horse, to shoot a bow and at least some sword play. She is also said to have developed the ability to drink prodigious amounts of alcohol. (see Rankin 46 also Yamazaki). Swords would play a reoccurring role, both in her life and literary work. 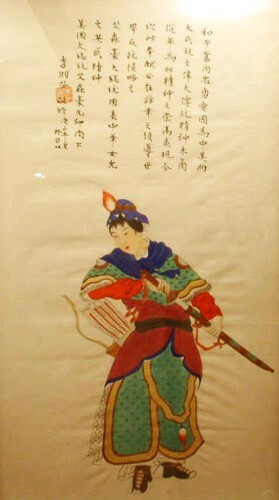 As an adult student in Japan, Qiu Jin is said to have carried a short sword and was even photographed with a long knife. Other individuals remember her training with, or talking about, swords as an adult after her return to China. How much of this was learned in her youth is open to interpretation, and there is not a lot of really detailed information on her early martial curriculum. So, was Qiu Jin studying the “martial arts?” From the point of view of a modern American reader the answer would probably be no. There is not much here that we recognize. She had no “style,” no “school” and no official and much beloved teacher. There is no evidence that she ever studied unarmed combat of any kind, and the thing that seemed to illicit the most comment from her contemporaries were her skills on a horse. Yet from the point of view of those around her Qiu Jin certainly was certainly studying the martial arts. A family such as hers lived and died by producing young men who could pass the civil service exam and maintain the family’s place in the gentry-class. Yet such clans rarely placed all of their eggs in a single basket. While the civil-service exam was much more prestigious, the state also ran a military-service exam. This system provided much of the nation’s officer corp. These were also important jobs that paid a steady income and provided some social status. The military service exams expected their students to have mastered the basic Confucian library but to also be familiar with a number of military texts including Sun Tzu. Practical aspects of the exam included archery, horsemanship, strength and the ability to perform sword routines, often with blades of different weights. Qiu Jin’s extended family was attempting to prepare some of their male children to take the military service exam and so they were teaching these skills. Indeed, her cousin Xu Xilin (later a fellow revolutionary) spent most of his career at the margins of military and law enforcement circles. Qiu Jin was indulged and allowed to study these more active subjects with her male peers even though these things traditionally lay outside the realm of propriety for female members of the gentry-class. It is not really clear how seriously Qiu Jin took this training or what sorts of skills she actually achieved (though by all accounts she was an accomplished rider). What was most interesting to the local community was that she was doing these things at all. It is also known that as a literarily talented child Qiu Jin immersed herself in the tales, stories and novels of the “Rivers and Lakes.” She was enchanted with stories about bandits and heroes who sacrificed themselves for the nation. I suspect that from her point of view these novels were, in fact, the true heart of the matter. To her the martial arts were not simply a style or a set of techniques. Rather they were a set of philosophical commitments and a way of life. To be a martial artist was to be a person who exhibited the qualities of martial valor. These norms were very much at odds with the Confucian worldview that surrounded her, and they helped to shape much of her revolutionary career. For Qiu Jin to be a “martial artist” was to live the life of a wandering swordsman. She called herself a “revolutionary” because that was the terminology of the time and indeed, a revolution was brewing. Yet what she really seemed to seek was justice on a personal scale. For her, to be a martial artist was to be a “revolutionary.” Yet her definition of the later term has always seemed to her critics to be oddly primitive and apolitical. She had no specific agenda or set long term goals for the state. It seems that in Qiu Jin’s mind a “revolutionary” was simply a western gloss on the beloved knights-errant of her childhood reading. Scholars have not fully grasped the degree to which Qiu Jin’s “revolution” was a sort of political-theater in which the military values of the heroic side of Chinese culture were scrupulously observed and performed. Many of the more paradoxical elements of her life, such as her penchant for cross-dressing or her near suicidal death (in which she allowed herself to be captured knowing that she would be tortured and executed) can be better understood within the context of late 19th century martial novels and plays than most historians to date have realized. Early 20th century feminist thought or western politically radical literature actually provides little guidance in these areas. Qiu Jin repeatedly discussed her fascination with the story of Hua Mulan, another Chinese woman who cross-dressed, took up arms, and fought to save the nation. Her educational background is important for another reason as well. While certain styles of martial arts with names and well defined social boundaries did exist in China from at least the Ming onward, these things appear to have been the exception rather than the rule. Most members of the gentry who studied martial matters did so in a private setting with certain concrete career goals in mind. These schools had no names because they had no public function. Their sole function was to advance the reputation and economic fortunes of a single local clan. However, they very often employed talented scholars, retired military trainers and civilian martial artists. Likewise when most peasants in the countryside studied martial arts it was to be part of a village militia. Some of the Big Sword societies had a unique style that they taught. For instance we know from Qing court records that Plum Blossom Boxing was popular throughout northern China early in the 19th century. Yet most people studied what the local drill instructor taught and probably didn’t associate any special name or “style” with what they were doing. Our insistent attempts to discover modern schools and lineage structures in the past (when they very likely did not exist) causes a lot of needless confusion and frustration. The career of Qiu Jin illustrates this nicely. It is precisely those questions about her background (what was the name of her style?) that demonstrates the shortcomings of our modern understanding of the Chinese martial arts in the 19th century. While this is the time period from which the “modern” approach to the Chinese martial emerged, not everyone was part of these trends. Rural peasants and gentry members, who were deeply steeped in the martial arts, tended to view of this material in ways that seems odd to modern sensibilities. 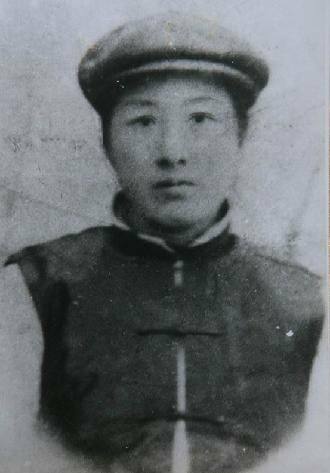 We will look more closely at Qiu Jin’s adult interests in the martial arts and her short-lived career as a political terrorist and revolutionary in the next post.